Boers & Co FineMetalworking Group uses a drone to help count inventory. The drone flies inside its 1.2-acre manufacturing plant and reads data from RFID tags. This automation is improving employee productivity. The data from the drone flows into its ERP system, which then generates reports. The ERP vendor is encouraging other businesses to use this tech as well. Boers makes high-precision metal parts for its customers. It doesn't own the products or designs -- its profit comes from the efficiency of manufacturing processes, not from selling products -- and that has made improving employee productivity important to its success. "We can't push any more productivity out of the current process, so we needed to invest more and more in automation and smarter thinking," said Jos Greeve, the ICT manager at Boers. ERP systems are used to track inventory, finances, prices, employees -- all the core activities of a business. But ERP vendors are encouraging their users to do more, such as adopt augmented reality and apply AI-type technologies to sensor data collected off machines and robots. ERP vendor Epicor highlighted Boers' use of the drone at its recent user conference. It's nudging users to try these technologies for improving employee productivity. But the vast majority of firms are not adopting them. A finance application with embedded AI is a tool that "would be great at Starbucks headquarters to make them more productive, but it doesn't help the barista at all," said Michael Fauscette, chief research officer at G2 Crowd. Firms may be using AI-type technologies, robotics and other tech for improving employee productivity, but their use is "still fairly contained," Fauscette said. The rate of productivity growth, a measure of output per worker, in the U.S. has nearly flatlined. It's at its lowest point in 40 years -- despite the drumbeat of innovations cited by tech makers. This weakness is reflected as well in IT department spending, according to Computer Economics. 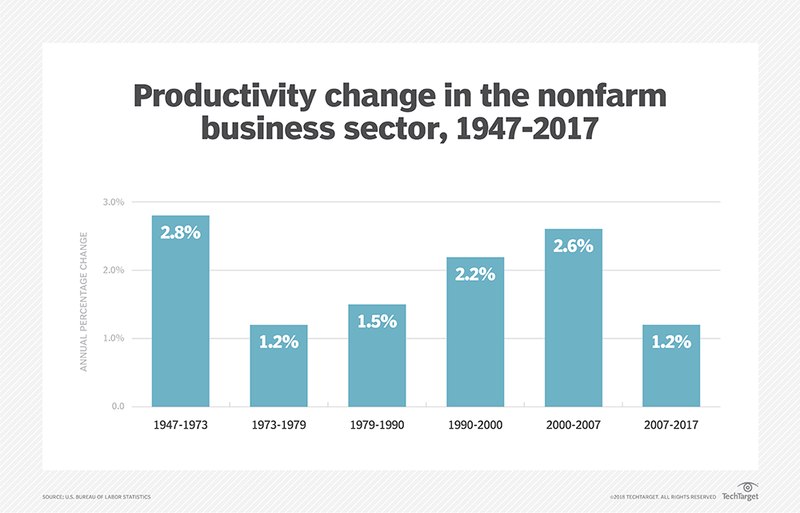 "The lack of productivity growth is to be expected," said David Wagner, vice president of research at Computer Economics, whose firm conducts ongoing benchmarking of about 200 IT department budgets. "Companies are not investing in new IT by increasing budgets. In fact, they have kept budgets under strict reign," he said. IT departments are keeping spending -- as a percentage of revenue -- in a "very tight window" of 2.3% to 2.5% since the recession. Most years, IT operational budgets have barely kept up with inflation, Wagner said. The size of the spending "isn't really enough to boost productivity," he said. In the area of AI, Computer Economics has found that most companies "are still shying away from machine learning and AI." Only 9% of the firms they survey have put AI to use, Wagner said. Indeed, Deloitte's recent "2018 Global Human Capital Trends" report noted that a survey it conducted of 1,500 senior executives "found that only 17% of them were familiar with both the concept of AI and its applications at their companies." ERP vendors are motivated to encourage users to try new technologies because it helps build relationships, as well as increase the value of their ERP systems to the customer's business. It may motivate on-premises customers to move to the latest version of an on-premises system "because they are going to want that piece of functionality," said Mickey North Rizza, program vice president of enterprise applications and digital commerce at IDC. But Rizza estimates that 10% to at most 15% of businesses generally are using these newer technologies, such as augmented reality or drones. But "it's starting to take off," she said. Improving employee productivity is at the heart of many of these newer technologies. A drone that counts inventory saves employees time. Analytics can be used for preventive maintenance on machines, reducing downtime. Augmented reality can be used by service techs to remotely connect with specialists, who can then help guide the installation and testing of a part. This underinvestment in new technology is something that Rick Veague, the CTO of ERP provider IFS North America, sees for himself. IFS produces ERP systems for a number of industries, including aviation and defense, automotive, and energy and utilities. IFS has demonstrated, for instance, a proof of concept to show how a drone can inspect utility lines and generate work orders. "The potential for productivity gains can be huge," Veague said of these technologies, such as augmented reality when used in repairs. This might involve a goggle-wearing field tech who is installing a new part and is using virtual reality to remotely work with a specialist. But there are sometimes cultural and financial obstacles to trying this tech, he said. Manufacturing, in particular, has been "under intense cost pressures," over the last decade, Veague said. Most of the IT organizations that have the capabilities to implement these technologies are "busy keeping the lights on and they don't have a lot of bandwidth to experiment with other stuff or have a list of 87 [other] things to do," he said. "You have to have a certain willingness to experiment," Veague said, "because what looks really interesting on the outset may not actually work in your specific setting." Weak gains in employee productivity is a global issue. But some firms are motivated to take action. Netherlands-based Boers is one such firm. Along with using a drone, Boers has equipped some employees with gloves that have built-in bar code scanners. The gloves beep if an employee has the right part and give haptic feedback if they don't. All this data goes into its Epicor EPR system. This includes plant floor machine sensor data. The manufacturer is working with Epicor to use AI-enabled pattern recognition for machine preventive maintenance. Greeve estimates that the combined impact of these technologies may lead to a 10% productivity gain. Economists imagine that with wide deployment of advanced technologies, productivity gains will be evident. "We really haven't reached the critical mass of investment and adoption within the guts of these legacy companies that's enough to move the needle [on productivity] on a national or even global basis," said Howard Rubin, an expert on technology economics.